At IEM Miri Branch, we are proud to provide the following services for your convenience. There are two routes that you can take in order to become a professional engineer with the Ingenieur (Ir.) title namely the Professional Interview (PI) route and the Professional Assessment Examination (PAE) route. 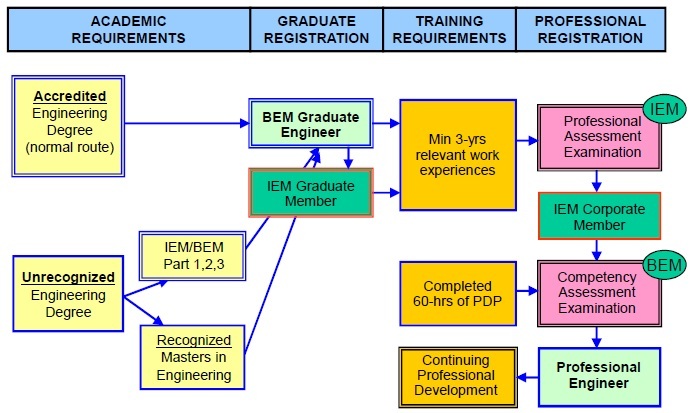 The PAE route is handled by BEM for engineers that are not a member of IEM. More information on this route can be found at the BEM website. In general, for the PI route, once you have graduated from an accredited university, you are only eligible to apply for the Professional Interview (PI) after you have registered with BEM and have relevant work experiences of at least three years. You will also need to have collected enough Professional Development Points (PDP) to apply. Upon submission of the proper documents and passing the interview, the candidate is then awarded a Corporate Membership of IEM and subsequent Professional Engineer status registration with the BEM. It is important to note that the “Ir.” status is one which is issued by BEM, not IEM. The diagram below illustrates this process. An extra assessment, which is the Competency Assessment Examination was proposed by BEM in 2008 and is expected to take effect in the near future. This assessment will test your knowledge and experience that you have acquired during your working period as an engineer. Before the actual interview, there are preparations to be done prior the interview. There are two documents to be prepared such as the training and experience report and the technical report. These reports must be prepared beforehand and to be submitted during the interview. Also, candidates have to complete the Form IEM/PI (1) and submit to the IEM for approval. Once approved by the relevant committee, a principal interviewer is chosen to interview the candidate. The actual interview is consists of two separate examinations; the oral examination and the written examination. For more details on the PI procedure, you may find it here. The IEM Miri can assist you in obtaining your Professional Engineer status as we provide the platform for you to engage with the principal interviewer chosen for you. The interview will take place at the IEM office nearest to you. However, if the suitable interviewer is only available in a different city, then you would need to travel there for your PI. The IEM Miri provides training for engineers to add their skills and knowledge to become a better engineer. Examples of trainings that we organised are such as the mandatory courses, project management, public speaking, presentation skills and more. These trainings are done by professional trainers trained by the IEM Training Centre. Also, the trainings, especially the mandatory courses, do come with Continuing Professional Development (CPD) points which will be essential for you to collect them and maintain your PE status. Joining the IEM Miri gives you the platform to engage with various people coming from different background and work field. The activities organised by IEM Miri creates opportunities for everyone to explore and understand the various societies that exist in Malaysia and also at an international level. Remember that engineers always work in groups and engineering knowledge are always updating. As long as you share as well as you receive, these connections are bound to prove valuable to you in the present and future. IEM Miri has a collection of books and journals that are available as references. Feel free to contact our secretariat to inquire our available books and drop by our office to refer to them. Alternatively, journals are also available for download at the IEM KL Website.